We’ve spent hundreds of hours over several months using six multiroom wireless speaker systems in every possible room and even outside to find the best multiroom wireless speaker system. Though new competition is better than ever, Sonos is still the best for most people. If you want something cheaper, Google Chromecast Audio does a decent job, but you’ll need to provide your own speakers. This post was done in partnership with Wirecutter, a buyer’s guide to the best technology. This is a condensed version of The Best Multiroom Wireless Speaker System; read the full review here. The best part about a multiroom wireless speaker system compared with a series of Bluetooth speakers is that it connects directly to the Internet instead of relying on your phone or computer. Just select the music you want to play and the machine will do the rest, freeing up your phone to do other stuff—with no notification sounds or ringtones to interrupt playback. And you can play different music in different rooms, or group them together, all while maintaining independent volume control on each unit. Our goal was to find a system that does all of this as seamlessly as possible. A great multiroom wireless speaker system should support as many streaming services as possible, make it easy to search across all services you subscribe to, and, of course, sound phenomenal. As of this writing, there’s still only one system that checks all these boxes. Sonos has made multiroom wireless speaker systems for longer than anyone, and the company’s experience shows. Though some other options are still missing core streaming services, Sonos has always been on the leading edge of compatibility and continues to add support for new services, like Apple Music. Sonos’s apps and cross-service search function are among the most polished available. And the company has an established record of supporting its products for as long as you own them in addition to releasing new features like Trueplay room-correction technology to maintain its lead in the face of stiffer competition. 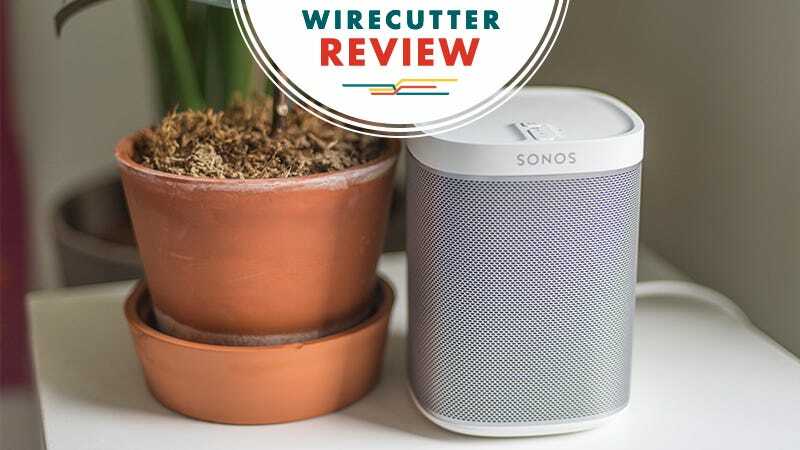 In interviews, expert reviewers from CNET and Sound & Vision agreed that despite recent competition, Sonos is still the best choice out there. Having access to your favorite music is the most important feature of a multiroom wireless speaker system, and the Sonos system continues to lead the way. Currently, it offers support for 48 streaming services, while many other systems offer a half-dozen or fewer. The major ones, such as Spotify, Pandora, Amazon, Google Play, and even Apple Music, are there, as are social services like Bandcamp and SoundCloud. You’ll also find more niche services such as Tidal, Concert Vault, Murfie, and 7digital. Beyond these you can play back your local music library and subscribe to podcasts. No matter how or where you get your music, the odds are that Sonos will support it. And it makes finding what you’re looking for easy with a unified search that covers all services and content types. For example, searching for Random Access Memories shows my local FLAC copy and streaming versions available on Spotify, Apple Music, Amazon, and Tidal. We also like that Sonos offers a variety of speakers and accessories at several prices to fit your budget. And all of them sound excellent. The $200 PLAY:1 is a great starting point. It costs less than most high-end Bluetooth speakers, yet measures as accurately as speakers costing several times as much. You can also pair up two PLAY:1s in stereo mode to get an amazing-sounding stereo setup for just $400—no amps or speaker wire required. If you want something with even better sound quality, the PLAY:5 can compete with midrange bookshelf speakers that require a separate amplifier. A single PLAY:5 in a horizontal arrangement creates a large soundstage on its own, and a pair can hold their own with similarly priced bookshelf speakers. Sonos also offers a soundbar option called the PLAYBAR, which has an optical input for pairing with your TV. It’s a great-sounding soundbar in its own right, but the Sonos integration makes it much more versatile. If you want to add some bass, the Sonos SUB can be added to any of these speakers to firm up the low-end response. Combined with the PLAYBAR and a pair of PLAY:1s you can create a full 5.1-channel wireless home theater system. You can add a number of other speakers and accessories to your system. The three-driver PLAY:3 sits between the small PLAY:1 and large PLAY:5 in terms of maximum volume, sound quality, and price. It’s the oldest model in the range, and we feel the PLAY:1 offers a better combination of sound and value than the PLAY:3 does now. We would rather get the PLAY:1 (or a pair for $100 more) or save up for the PLAY:5 instead of getting the PLAY:3. There’s also the Sonos CONNECT, which has inputs and outputs that let you add any existing speakers or inputs to your system, such as a turntable or a Bluetooth/AirPlay receiver. And then there’s the BOOST, which can improve connectivity in larger homes. If you already have speakers around your house and want an easy, affordable way to get music to them, the Google Chromecast Audio does the job adequately. It lets you stream from a huge number of iOS and Android apps, supports grouping rooms together, and offers high-resolution audio. However, it doesn’t have the simple, single app that Sonos offers (instead, it’s integrated into individual apps and browsers) and some services still don’t work with it. Furthermore, unless your speakers have automatic input sensing, you have to manually turn them on when you want to use them. Sonos handles all of that directly inside the app. But you can forgive a lot of the Google Chromecast Audio’s downsides for its currently price of $35 a pop.